At The Braces Place, we strive to make the time you spend wearing Invisalign or braces as comfortable, effective, and smooth as possible. If you’ve chosen to improve your smile with braces, we’ll teach you how to adapt to life with braces and give you plenty of care tips so your treatment goes along as planned. Once Dr. Pennella has put the braces on your teeth, it’s up to you to do a good job with your brushing and flossing so you can avoid some common problems like dental decay while keeping your braces and teeth sparkling clean. While you already know how to clean your teeth, brushing and flossing is trickier to do when your teeth are covered in bands, brackets, and wires. But don’t worry, we’re here with some handy tips to help you do a great job with your oral hygiene! Plaque is a sticky substance made up of a combination of food, saliva, and bacteria that must be removed from your teeth every day to help you avoid problems like cavities, swollen gums, white spots on teeth, and bad breath. Keeping plaque under control is one of the best ways to keep your teeth and gums healthy. To fight plaque, you must do three basic things: control your diet, brush and floss your teeth well, and visit your family dentist regularly for checkups and professional cleanings. A big part of fighting plaque and keeping your teeth and braces clean is diet control. Controlling your diet involves steering clear of foods that put you at risk of developing tooth decay. Try to avoid eating cavity-causing sugary and sticky foods that can harm both your teeth and braces like cakes, cookies, caramels, toffee, and licorice. It’s just as important to avoid foods that can bend and break the appliances on your teeth like nuts, hard-crusted bread, pizza crust, and beef jerky. When you want to eat a snack, try something healthy like fruit, cheese or yogurt. And remember not to chew on ice, pencils or your nails as these habits can break your braces and even chip your teeth! When you’re wearing braces, you’ll have to step up your brushing and flossing game a bit to make sure you get in and around all those tight spaces after each meal. 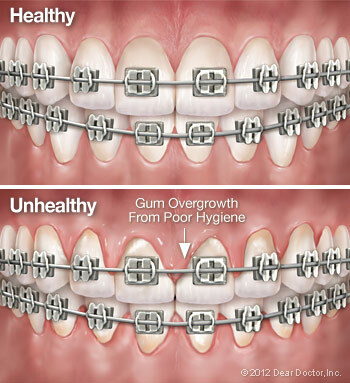 You certainly don’t want to smile broadly without knowing that you have some food stuck in your braces! Doing a great job with your toothbrush and floss will help you avoid some potentially embarrassing situations. Proper brushing and flossing will also help you avoid cavities and other problems with your teeth and gums. To properly brush your teeth, use either a soft bristled brush or a bi-level brush that will be effective in removing plaque. You can also use an electric toothbrush on a moderate setting. For those hard-to-reach areas, try a proxabrush that’s shaped like a pipe cleaner to make it easy to clean around your brackets and wires. Gently brush all the surfaces of your teeth and try to get the bristles into all the tiny spaces where food and plaque collect. You should be brushing your teeth after every meal and before bedtime. When you’re finished brushing, take a good look in the mirror to be sure you haven’t missed any bits of food that may be stuck around your braces. Those wires connecting your brackets from tooth to tooth make flossing a challenge. However, the task of flossing can be done well if you take your time. We recommend using a floss threader that makes it much easier to get the floss between the wires and brackets and along the gum line. And be sure to use waxed floss because your braces can shred regular floss to leave behind a stringy mess. If you’re wearing Invisalign aligners or a retainer, you should brush your aligners or retainer daily using a soft bristled toothbrush. It’s also fine to use a special aligner/retainer cleaner but never use hot water as it can cause warping. Even though you’ll be seeing our Lexington orthodontist regularly, you will still need to visit your dentist for regular exams, cleanings, and preventative care. Just think of your orthodontic treatment as a team effort that involves our office, you, and your family dentist all working toward giving you an amazing smile you can enjoy for the rest of your life! All the extra effort and time you put into your oral hygiene will be worth it in the end when your braces come off and you’re left with an incredible new smile! And remember that your friends here at The Braces Place are always available to answer any questions you may have about keeping your teeth and braces clean! So please, don’t hesitate to contact us if you need some help!